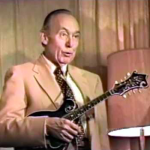 Bill Monroe is a very important figure in the world of mandolin. He helped create bluegrass music, earning him the title Father of Bluegrass. Bluegrass is encompassed by the genre of country music, taking root in Irish, Scottish and English music while incorporating elements of jazz. These traditional music styles often take the form of ballads and folk dance music. When listening to bluegrass you will notice that different instruments take turns playing lead roles, known as the head of the song. These are often improvised around while one instrument plays the melody, and this is where the jazz inspiration comes in. 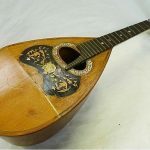 When bluegrass was born, this style was so different compared to old-time music, where all the instruments would play in harmony together, or one would lead and others would accompany. 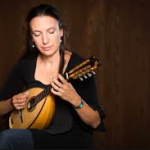 There is traditional bluegrass with acoustic instrumentation; progressive bluegrass, which uses electric instruments or other music styles; and bluegrass gospel, which uses Christian lyrics and soulful singing. Bill Monroe played traditional bluegrass, which uses acoustic instrumentation with traditional chord progression. He was born in Rosine, Kentucky in 1911 to a musical family that sang and played music at home. Many famous musicians grew up this way, enabling them the early practice that would turn them into stars. His brothers played the fiddle and guitar, so he was rather forced to take on the mandolin. His mother died when he was ten, and his father died when he was 16. This forced him to live with varying aunts and uncles, until he settled with his uncle Pendleton Vandiver who would accompany him with the fiddle at dances. Monroe recorded a song in 1950 entitled “Uncle Pen” for him, and later in 1972 recorded an entire album called Bill Monroe’s Uncle Pen. Indeed, it was Uncle Pen who taught him all the ways of that music including a large repertoire of fiddle songs from traditional music: these songs are what got into Bill’s bones and created a hunger for the fast-paced melodies. He also gave credit to a fiddler and guitarist named Arnold Shultz who introduced him to the blues. He moved for work in 1929. While working at an oil refinery with his brothers, they played music together until 1938. He spent some time searching for band members and eventually formed Blue Grass Boys, whose songs had the early beginnings of bluegrass style including fast tempos and virtuosic instrumentation. Monroe was still experimenting with his band’s sound. He only sang tenor harmony rather than lead vocals; likewise, his banjo player did not play any solos. All of the recordings from 1940-1945 showed a transitional style between tradition string-band music and the genre he was about to create. These new additions to the music included a rhythm guitarist (Lester Flatt) that would help keep the time, and a banjo (Earl Scruggs) played with three-finger picking style. Monroe and his band Blue Grass Boys performed at the Grand Ole Opry and added fiddler Chubby Wise and bassist Howard Watts. This band recorded 28 songs between 1946 and 1947, and these songs would come to be known as the classics of the bluegrass genre. Some of their best known songs are “Toy Heart” and ballad “Blue Moon of Kentucky” which was later recorded by Elvis Presley in a rock-n-roll style. Bill Monroe also recorded some gospel songs, with four-part vocals accompanied by mandolin and guitar. He felt the church songs should be as raw and true and possible. Flatt and Scruggs left the band in 1948 to form their own group, but Monroe went onto the golden age of his career with new members in the Blue Grass Boys, including lead vocals and rhythm guitar, banjo and fiddler. It was with this new band he recorded his song Uncle Pen, with other bluegrass classics like “My Little Georgia Rose” and a mandolin feature called “Raw Hide.” These years saw big success for the band until Monroe and bass player Bessie Lee Mauldin were in a car accident. He spent four months recovering from the injuries until he resumed touring. Into the late 1950s, bluegrass had lost its popularity and there was less and less demand for his band’s live performances, despite their regular spot on the Grand Ole Opry. However, the popularity of folk music in the 1960s brought him back into the spotlight as young students and fans of folk saw him and Blue Grass Boys as folk rather than country. They expanded past the southern country music scene in the later 1960s and was the central figure of a 1965 bluegrass festival in Virginia. The diverse backgrounds of his band members contributed to an overall more diverse sound and they were widely received. The bluegrass revival went into the late 1960s and 1970s and his band continued to record and release music up into the 1980s. In 1989, he celebrated his 50th year on the Grand Ole Opry. His last performance was March 15, 1996, and he passed away September 9, 1996 in Springfield, Tennessee.